This article is about the town in London, England. For other uses, see Beckenham (disambiguation). 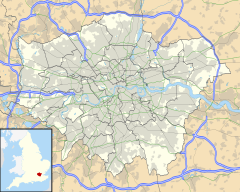 Beckenham is a post town and district of London in the London Borough of Bromley, England. It borders Beckenham Place Park and Bellingham in the London Borough of Lewisham (to the north) and is centred 8.4 miles (13.5 km) south east of Charing Cross. Historically part of Kent, Beckenham was, until the coming of the railway in 1857, a small village, with most of its land being rural and private parkland. John Cator and his family began the building of villas which led to a rapid increase in population, between 1850 and 1900, from 2,000 to 26,000. Housing and population growth has continued at a lesser pace since 1900. The town has areas of commerce and industry, principally around the curved network of streets featuring its high street and is served in transport by three main railway stations — nine within the post town — plus towards its western periphery two Tramlink stations. In common with the rest of Bromley, the largest borough of London by area, Beckenham has several pockets of recreational land which are a mixture of sports grounds, fishing ponds and parks. The place-name 'Beckenham' is first attested in a Saxon charter of 862 as Biohhahema mearc. The settlement is referred to as Bacheham in the Domesday Book of 1086, and in the Textus Roffensis as Becceham. The name is thought to derive from Beohha's homestead (Beohha + ham in Old English). The name of the small stream here – the River Beck – is most likely to have been named after the village. Central Beckenham, flooded in 1878. Although early written history tells little of the area, archaeological evidence at Holwood Park, where Stone Age and Bronze Age artifacts have been found, reveals some evidence of early settlers. A Roman camp was sited here, and a Roman road, the London to Lewes Way passed through the district. With the arrival of the Normans, the Manor of Beckenham took on added importance, and controlled much of what is modern Beckenham. St George's Church was built in the 12th century. In the Middle Ages, the manor lands were divided: at this time the estates of Kelsey and Langley came into being. Beckenham still remained a small village until well into the 19th century. The beginning of its growth began when, in 1773, John Cator built Beckenham Place and became Lord of the Manor. After he died in 1807, his sons soon became aware that the area in such close proximity to London was ripe for development, especially once the railway had arrived in 1857; and large villas began to be built around the new station. Wide roads and large gardens epitomised these properties. Between then and the early 20th century, further growth of Beckenham took place: the Shortlands area in 1863; Clock House in the 1890s; Elmers End in 1911 (where smaller suburban houses were built); Park Langley in 1908; and Eden Park in 1926. The Manor of Foxgrove was also broken up at some point: its name is commemorated in a local road. Beckenham is a suburb and a town in its own right with a non-bypassed non-pedestrianised high street on a route between the rest of the borough and South London and has spread about its centre on 15 pre-1850 houses which are listed buildings. The Municipal Borough of Beckenham came into being in 1935. It took over from what had been, since 1894, Beckenham Urban District Council and included parts of Hayes and West Wickham, previously part of Bromley Rural District Council. The new Borough status reflected the growth of Beckenham in less than fifty years. In 1965, as part of the creation of the Greater London Council, the Borough council was disbanded and Beckenham came under control of the newly constituted London Borough of Bromley. Councillors represent various parts of the Borough of Beckenham. Beckenham Town Centre Management coordinates business interests in the town. The original village of Beckenham was a cluster of development in its own fields at what is now the north. Around it were the great manorial estates: Beckenham, Kelsey and Langley Halls and Parks. The River Ravensbourne flows northwards at the eastern side of the town, towards its confluence with the River Thames. A small stream, the River Beck, passes through the town before joining the Ravensbourne further north. The area is part of an outcrop of London Clay and consists of many small hills. Despite its leafy image, its close proximity to Central London and nine railway stations within the post town (Beckenham Junction, Clock House, Birkbeck, New Beckenham, Ravensbourne, Kent House, Elmers End, Eden Park and Beckenham Hill), make Beckenham a good business location. The town's busy high street contains many restaurants and upmarket chains, as well as family-run independents, and the area has a good selection of well performing schools. Beckenham is the headquarters to Capita Registrars Limited who provide share registration services for more than half of the UK’s quoted companies, Proper Records, the UK's biggest independent music distributor and Vizual, a leading HR software developer. One of the interesting landmarks in Beckenham is the Chinese Garage, now a listed building. It is built in an unusual Japanese pagoda style and formerly operated as a car dealership selling Peugeot and Kia cars. Its future is currently being decided. There is also St George's Church, dating back to 1100 but mostly rebuilt at the end of the 19th century. The lych gate dates from the 13th century, and is one of the oldest in England; the almshouses date back to 1694. There are two old pubs, Ye Olde George Inn (1662), and the Three Tuns (now a branch of Zizzi restaurants). Kelsey Park is another landmark. It was part of the Kelsey Estate, but the mansion no longer remains. The only surviving buildings are the two Grade II listed lodge cottages at the entrance, which are over 200 years old. Beckenham is served by nine rail stations - Beckenham Junction, Clock House, Birkbeck, New Beckenham, Ravensbourne, Kent House, Elmers End, Eden Park and Beckenham Hill. Beckenham Junction and Kent House have services into central London every 15 minutes, taking just 13 minutes to Brixton and 21 minutes to London Victoria. Beckenham Junction also provides services into London Bridge every 30 minutes, taking 35 minutes, and to Orpington every 15 minutes, taking 7 minutes to Bromley South and 17 minutes to Orpington. Ravensbourne station and Beckenham Hill provide direct access to central London and the City every 30 minutes - Peckham Rye in 12 minutes, Elephant & Castle in 23 minutes, London Blackfriars in 27 minutes, City Thameslink in 29 minutes, Farringdon in 33 minutes and London St Pancras in 37 minutes. New Beckenham, Clock House, Elmers End and Eden Park have services to London Charing Cross, London Bridge, Waterloo East, London Cannon Street and to Hayes. Tramlink serves Beckenham with services from Beckenham Junction and Elmers End to Wimbledon via East Croydon. Birkbeck station serves both the tram and rail services, the stop of Elmer's or Elmers End which is associated with Beckenham and shares its Clockhouse ward. Beckenham is served by several Transport for London buses that link the town with other areas including Bromley, Catford, Chislehurst, Croydon, Crystal Palace, Eltham, Lewisham, Orpington, Penge, West Wickham and Woolwich. The town has a number of places of worship. St. George's Church is the principal parish church, and is in the centre of Beckenham. It was extensively rebuilt, at the end of the 19th century, but an earlier building dates back to 1100. It has a 13th-century lych gate that is thought to be one of the oldest in England. The almshouses next to the church go back to 1694. There are also three other Anglican churches in the town: All Saints Church; Holy Trinity Church; and St James at Elmers End. In addition, there are Methodist and Baptist churches; and the Roman Catholic church dedicated to St Edmund of Canterbury. Town churches include: St. George’s Church (W. Gibbs Bartleet, 1885–1887), St. Barnabas on Oakhill Road (A. Stenning & H. Hall, 1878 or 1884), Christ Church, Fairfield Road (Blashill & Hayward, 1876), St. Edmund’s Catholic Church, Village Way (J. P’Hanlon Hughes, 1937), St. James, St. James’ Avenue (A.R. Stenning, 1879–1898), St. Michael and All Angels, Ravenscroft Road (W. H. Hobday & F. H. Maynard, 1955–1956), St. Paul, Brackley Road (Smith & Williams, 1872), Holy Trinity, Lennard Road (E.F. Clarke, 1878), Baptist Church, Elm Road (Appleton & E. W. Mountford, 1889), Congregational Church, Crescent Road (J. W. & R. F. Beaumont, 1887-8), Methodist Church (James Weir, 1887). Strictly defined to its historic parish area translated to today's modern wards of the United Kingdom, Beckenham covers four such wards, however as a post town it contains more than 82,000 people as at the 2011 census. The principal secondary schools in Beckenham are Harris Academy Beckenham (formerly Kelsey Park Sports College); Harris Academy Bromley (formerly Cator Park School); and the two Langley Park schools: for boys and girls. There are also a large number of schools catering for primary education, including the independent Roman Catholic school, Bishop Challoner, St Mary's Catholic Primary School, Marian Vian Primary School, Balgowan Primary School, Worsley Bridge Primary School, Harris Primary Academy Beckenham (formerly Bromley Road Infants School), Clare House Primary School and Churchfields Primary School. Beckenham Hospital, now called Beckenham Beacon, following redevelopment, is a minor treatment centre and an outstation to Princess Royal Hospital in Farnborough for outpatient services. It has GP, dental and other services available. The Bethlem Royal Hospital, which specialises in psychiatry is located along Monks Orchard Road, next to the border with Shirley. There is a museum and archive at Bethlem Royal Hospital. The local Odeon cinema has six screens and is a grade II listed building. 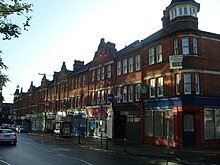 Like most towns of its size, Beckenham has several leisure organisations and societies. The Beckenham Festival of Music and Dancing takes place every November. Beckenham Theatre puts on amateur productions. The Beckenham Concert Band  is a community wind band which has, over the last 35 years, raised thousands of pounds for local and national charities. It caters for amateur wind and brass musicians and performs locally during the winter months and across London and the South East during the summer. The South East London Green Chain, a long-distance footpath, crosses through Beckenham. Both Cator Park and Beckenham Place Park form part of the Chain. There are other open spaces in the town, including Croydon Road Recreation Ground and Kelsey Park. South Norwood Country Park abuts the town to the south-west. There is also a walk starting in Cator Park, going down the High Street, through Kelsey Park, then Croydon Road Recreation Ground and back to Cator Park. Beckenham Green, in the town centre, hosts regular markets and activities throughout the year. Beckenham has a Non-League football club Beckenham Town F.C., which plays at Eden Park Avenue, and a Sunday Football team, Beckenham Manor Football Club, which plays at Langley Sports Club. Beckenham Cricket Club plays at Foxgrove Road, a former first-class cricket ground. It has been the breeding ground of England internationals Derek Underwood and Richard Ellison, and most recently Kent County captain Robert Key. From 1886 to 1996, the club also staged the Kent Championships, an international tennis tournament, which featured many of the world's top players because it opened the grass-court season building up to The Championships at Wimbledon. In June 1968, the club held the world's first "open" grass-court tournament - one month after the sport became open to amateur and professional players - with Australians Fred Stolle and Margaret Court winning the singles titles. Beckenham Cricket Club is also the home to Bromley and Beckenham Hockey Club with eight men's teams and five women's team, and one of the largest junior hockey sections in the UK. Beckenham Rugby Football Club is a rugby union club formed originally in 1894. It fields six senior men's teams a successful women's team, and also has one of the largest youth sections in the South East. Beccehamians RFC, a rugby union club founded in 1933, plays competitive rugby at Sparrows Den, at the bottom of Corkscrew Hill near West Wickham. Swimmers from Beckenham Swimming Club, established in 1893, have gained medals in the 21st century at national and international levels. The training ground for Premier League club Crystal Palace is located on Copers Cope Road. In Simon Brett's long-running BBC Radio 4 comedy drama, No Commitments (1992–2007), Beckenham is the home of the wildly snobbish, socially aspirational and insecure sister Victoria; the town is frequently mocked by association. Beckenham is also one of the main locations of the novel The Buddha of Suburbia (1990), by Hanif Kureishi. The burial site is at Beckenham Crematorium (also known as Elmers End Crematorium and Cemetery). The Beckenham Police Station building is situated in Bromley Road. Among those who have either been born or lived in Beckenham or have had some important contribution to make to the town, are politician and colonial administrator George Eden, 1st Earl of Auckland (1784–1849), politician and diplomat William Eden, 1st Baron Auckland (1745–1814), Admiral of the Royal Navy Sir Peircy Brett (1709–1781), CSgt Frank Bourne of Rorke's Drift (who lived at 16 King's Hall Road, Beckenham and is buried in Beckenham Cemetery), eminent judge Wilfred Greene, 1st Baron Greene (1883–1952 – born at 8 Fox Grove Road) and Fr. Thomas Pelham Dale SSC, an Anglo-Catholic clergyman prosecuted for Ritualist practices in the 1870s. Writers include Enid Blyton, Walter de la Mare who lived in Mackenzie Road, and A.L. Barker (1918–2002). Show business people include Bob Monkhouse (1928–2003), Julie Andrews (1935- ), David Bowie (1947–2016 - who lived at 42 Southend Road from 1969–1973), Peter Frampton and Dutch singer Wende Snijders (1978- ); pop/rock musician David Sylvian was born in the town, but was raised in nearby Catford. The actress and presenter Floella Benjamin (now Baroness Benjamin of Beckenham) grew up in Mackenzie Road, Beckenham. Other actors include Maurice Denham (1909–2002), and Simon Ward (1941–2012). Betty Box (1915–1999) and her brother Sydney (1907–1983) were film producers. There are many sportsmen, especially cricketers, plus Tom Pettitt (1859–1956), real tennis world champion 1885–90. Boxer David Haye, WBA champion, moved to Beckenham in 2010. ^ a b "Check Browser Settings". statistics.gov.uk. ^ Eilert Ekwall, The Concise Oxford Dictionary of English Place-names, p.33. ^ a b Brewer's Britain and Ireland, compiled by John Ayto and Ian Crofton, Weidenfeld & Nicolson, 2005, ISBN 0-304-35385-X. ^ "Ideal Homes: Suburbia in Focus". Archived from the original on 21 September 2008. Retrieved 4 November 2008. ^ "About Beckenham Town Centre & Historical Information - Beckenham TownTalk". towntalk.co.uk. Archived from the original on 23 October 2009. Retrieved 4 November 2008. ^ "Beckenham Town Centre Management". Archived from the original on 19 November 2008. Retrieved 4 November 2008. ^ "How to sell music the Proper way". BBC News. ^ Good Stuff. "Two Lodges to Beckenham Place - Bromley - Greater London - England - British Listed Buildings". britishlistedbuildings.co.uk. ^ "Beckenham churches". Archived from the original on 28 October 2008. Retrieved 4 November 2008. ^ "Business Category -Beckenham Community". beckenham.net. ^ "Southwark Parish Directory". rcsouthwark.co.uk. ^ "Beckenham - politics.co.uk", April 2010, web: Pol-51 Archived 22 March 2012 at the Wayback Machine. ^ "Harris Academy Bromley - Harris Girls' Academy Bromley". harrisbromley.org.uk. ^ "Langley Park School For Boys - Home". lpbs.org.uk. ^ "Home - Langley Park School for Girls". lpgs.bromley.sch.uk. ^ "Bishop Challoner School". Archived from the original on 9 February 2012. Retrieved 3 December 2018. ^ "Default - St. Mary's Catholic Primary School". st-marys-catholic.bromley.sch.uk. ^ "Balgowan Primary School - Primary School". balgowan.bromley.sch.uk. ^ "Bethlem Museum of the Mind". Bethlem Museum of the Mind. ^ Good Stuff. "Abc Cinema and Regal Ballroom - Bromley - Greater London - England - British Listed Buildings". britishlistedbuildings.co.uk. ^ "Beckenham Theatre Centre - home page". beckenhamtheatre.co.uk. ^ a b "Home". beckenhamconcertband.com. ^ "Beckenham Rugby Club". pitchero.com. ^ "Beccehamian RFC Home Page". beccehamians.co.uk. ^ "Beckenham Swimming Club". Archived from the original on 12 February 2013. Retrieved 4 January 2013. ^ "Floella Benjamin appointed Baroness of Beckenham". News Shopper. "Beckenham" . New International Encyclopedia. 1905. "Beckenham" . Encyclopædia Britannica (11th ed.). 1911. "Beckenham" . Encyclopedia Americana. 1920.